Are you looking for the best domain registrars of 2019? Domain registrars are the companies responsible for registering and managing domain names for all websites around the world. Choosing the right domain name registrar is very important because there are so many ways to get tricked. In this article, we will show you how to choose the best domain registrar by comparing their pros and cons. Bonus Tip: If you want to register a domain name for free, then skip to the #2 provider in our list. Here is a quick overview of things you will learn in this guide. What Domain Registrars Really Do? Domain names make the internet easy to use for everyone. Without domain names, you’ll have to enter long strings of numbers called IP addresses to visit websites. Domain names solve this problem by allowing websites to choose addresses using easy to remember words, for example, wpbeginner.com or google.com. 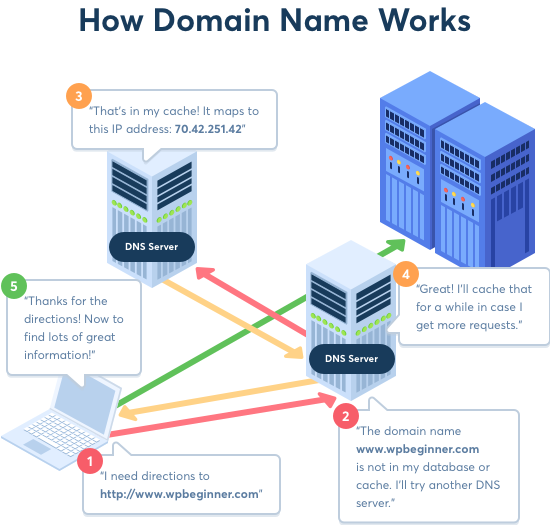 To learn more, see our beginner’s guide on what is a domain name and how does it work. To make domain names widely available, ICANN allows companies to apply for accreditation and become a domain registrar. These companies then compete with each other to sell domain name licenses which allows you to get better service and tools when you purchase your domain name. All domain name records are stored in a centralized database called registry. For a domain name to be recognized, it needs to be added into that database with all related information about it. A domain name registrar is given permission by ICANN to make changes to your domain name’s information in the database on your behalf. A domain name registrar also provides easy to use tools to make those changes using your web browser. 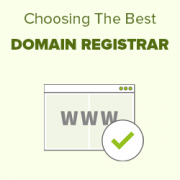 That being said, let’s take a look at how to easily choose the best domain registrar for your website address. Not all domain registrars have the license to sell all domain name extensions. For example, some domain registrars can only sell domain names with country-specific extensions (like .io, .in, or .ly). Each domain registrar may offer different services along with the domain name registration. Some registrar may offer cheap domains as their promotional offer while others may give free add-ons to attract customers. The first thing you want to check is the domain name prices. For example, some domain registrars may offer lower prices for the first year registration, but their renewal prices can be different and significantly higher. You can register a domain name for a minimum period of 1 year. However, some companies may require a higher registration period like 2 years minimum. You can register a domain name for up to 10 years at a time. If you are buying a new web address, then we recommend registering your domain name for 1 year. You can turn on automatic renewal, so your domain does not expire. You also need to check for any additional fees for domain transfers, renewal, and other charges. Domain names can be moved from one domain registrar to another. Normally, you wouldn’t need to transfer your domain name right away, but if you’re unhappy with your domain registrar, then this option should be easily available. The first thing you need to keep in mind is that you cannot transfer a domain name during the first 60 days of the registration. This initial period is decided by ICANN. After that, you are allowed to move it to any other registrar that you want. Most domain registrars make it easy to transfer domain names without any extra fee. However, some may try to make it complicated or charge an extra fee. Make sure that you review the domain transfer policy before you buy a domain name from a registrar. Domain names are registered for a specific duration. You can renew your domain registration before its expiration date. However, if you forgot to renew your domain name, then it expires and anyone can register it. For businesses, this means someone can take over their domain name. To make sure that this doesn’t happen, you can set up automatic renewals for your domain name. Even if you use the automatic renewal feature, it is a good idea to check your domain registrars expiration policy. Some domain registrars offer a grace period even after the expiration. This grace period allows you to renew your expired domain name. We have heard dozens of horror stories of business owners losing their domain name because their credit card expired, and their registrar did not have a grace period. This is one of the many reasons why it’s extremely important to choose the right domain name registrar. You may also want to review what other services are offered by your domain registrar. While you may not need these services right now, it is good to know that they have them. These add-on services may include domain privacy, domain parking, extended expiration protection, and more. Some domain registrars may even sell WordPress hosting service, email hosting service, and more. Due to the competition in the domain registration business, you will come across companies with some very attractive offers. While these offers may look good, there may be some downsides that you may not notice right away. Following are a few things to watch out for when choosing a domain name registrar. Some domain name registrars can automatically pre-check add-on services when you purchase a domain name. If you don’t uncheck those options, then this would increase your bill significantly. Typically a .com domain name should not cost you more than $14.99 / year. If it does, then it should raise a red flag. You must pay attention to the checkout page and uncheck any add-on services that you don’t need. On top of that, it’s always a good idea to double-check the total amount you are charged in your credit card statements. Most domain registrars try to make their website easy to use, so they can keep you as a customer. However, some domain registrars do the exact opposite. This would make it difficult for you to change your domain name settings. You will need to do that if you wanted to transfer domain to a new host, or a new domain registrar. The easiest way to look for this is by searching for domain registrar’s online reviews. Keep in mind, that very few happy customers leave online reviews, so it’s important to read the reviews thoroughly. You may also need to look for the hidden costs and fees when choosing a domain registrar. Some domain registrars may have special offers for cheaper domains for first-time registrations. Most beginners don’t realize it, but the renewal cost of the domain are often quite different and even higher. All good domain registrars make it easy to transfer your domain name to a different company. However, some will put an additional fee. That being said, let’s take a look at some of the best domain name registrars, and how they compare against each other. Choosing the right domain registrar saves you from possible future problems. It not only helps you protect your brand name but also makes it easy to move your website to a new host or service provider. Based on the criteria we discussed earlier, these are the top domain registrars to buy your domain name from. 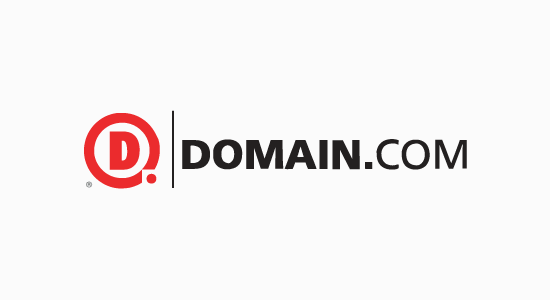 Started in 2000, Domain.com is one of the most popular domain name registrar on the planet. They allow you to register all top level domain name extensions (TLDs) and even dozens of country code top level domains (ccTLDs). Domain.com has a quick domain search tool that you can use for your domain name research. Their search also shows you premium domains as well. You get access to all domain management tools that you would expect from a top domain registrar including private registration (domain privacy), bulk registration, easy transfers, easy DNS management, and more. You can even purchase web hosting from them if you like. If you have any questions, then you can contact their helpful support via live chat or email. If you only need to register a domain name without web hosting, then we highly recommend Domain.com. However, if you’re looking to start a blog or website, then option #2 might be better for you because you can get a free domain name. 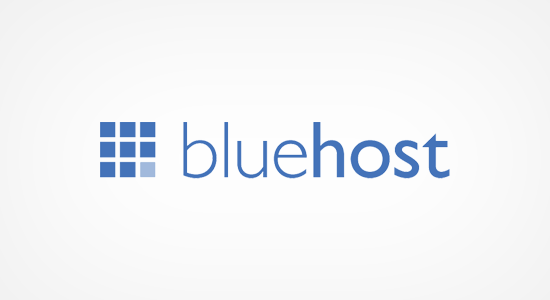 Bluehost is one of the largest hosting companies in the world, and they are an official WordPress hosting partner. As part of their web hosting service, they also offer domain name registration. Bluehost is offering WPBeginner users a free domain name, SSL certificate, and a discount on web hosting which is a perfect deal for anyone looking to make a website. Basically, you can get started for $2.75 per month, and get a free domain name. 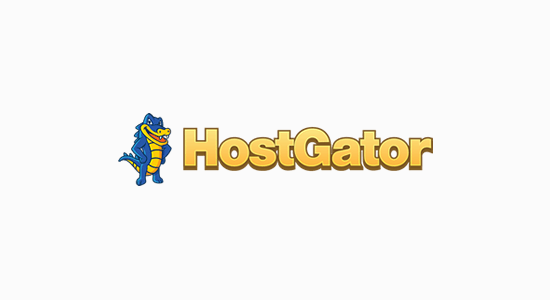 HostGator is another popular company offering website owners a one-stop shop for domain names and shared website hosting. They offer a nice selection of extensions, domain privacy, and easy to use DNS management tools. They have an easy to use domain search tool that helps you quickly find a suitable domain name for your business. Their domain management area is beginner friendly and well documented which makes it easy to transfer domains if you need to. GoDaddy is one of the oldest and most popular domain registration company. They manage more than 77 million domain names for over 18 million customers. They offer a wide variety of popular domain name extensions to choose from. Their prices are highly competitive, and you may even get a significant discount on the first year of your domain’s registration. GoDaddy has a powerful easy to use domain management interface which allows you to transfer your domain name or change its settings. 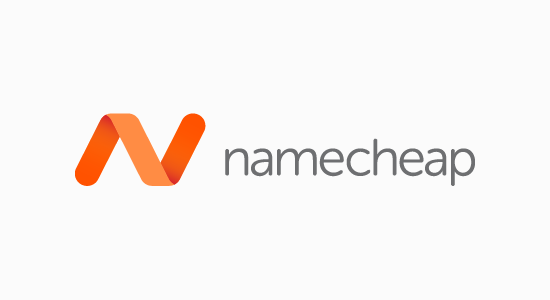 Namecheap is another top domain registrar on the market. They have a powerful domain search tool that helps you find the right domain name and makes suggestions when your preferred domain name is not available. They also offer domain add-on services like domain privacy and premium DNS. Their domain management area is clean, but it’s not as user-friendly as GoDaddy’s new interface. One nice thing about NameCheap is that they offer free domain privacy with all their domain names. We used to use NameCheap but ended up transferring our main domains to other providers because we simply had too many issues logging into their domain management panel. 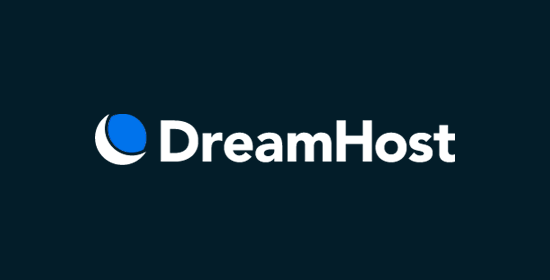 DreamHost is another popular domain name registrar and web hosting service provider. They are offering our readers a free domain name with domain privacy included for anyone signing up for their Shared Unlimited hosting plan. You can also register a domain name without buying hosting through them for $8.99 / year which also includes free private registration. DreamHost offers 400+ TLDs and comes with all domain management tools that you can expect from a large domain provider like DreamHost. Shopify is a popular eCommerce platform which allows anyone to easily start an eCommerce store without any technical skills. They are also a popular domain name registrar and allow you to quickly set up a store using your custom domain name. 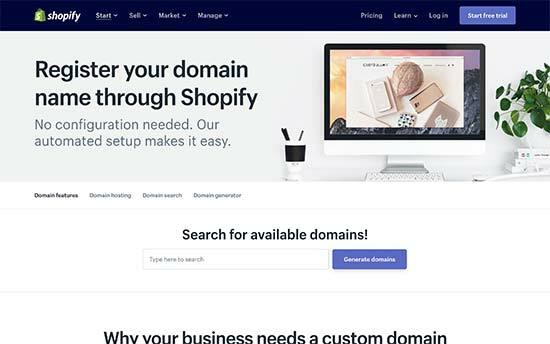 Shopify also comes with a powerful business name generator which helps you pick up an available domain name for your business. You can move your domain name away to any other service if you want. One downside is that they don’t offer email addresses for domain names. Instead, you can use email forwarders or use a third-party email service like G Suite. BuyDomains allow you to search for premium domain names matching your search terms. Premium domain names are domain names that are already registered but are available for sale from third-party. These domains are often more memorable, shorter, and brandable which is why they are more expensive. If you cannot find a suitable domain name, and you have the budget, then you can use BuyDomains to search for a premium domain name. 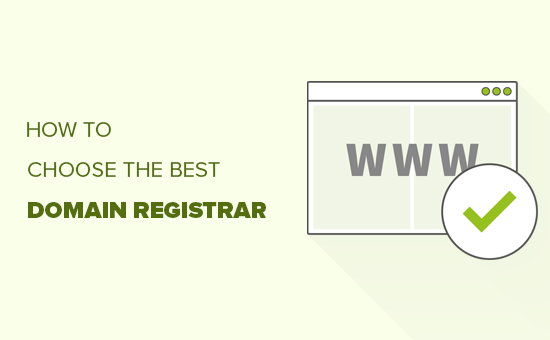 We hope this article helped you learn how to choose the best domain registrar for your business. You may also want to see our guide on how to get a free business email address for your website. On the host, does a host provide an SSL certificate even when the domain name is registered with a different domain registrar? Another question about BlueHost: does BlueHost offer domain privacy options and if yes, what would be the price of your discounted offer of $2.75/month in case one required that they offer domain privacy or does the package still come with domain privacy as an option to choose from? Okay, I will see what I’ll do about it. Thanks though and do have a great time. We use Namecheap.com not only the good price but for the DNS management panel and moreover for the support 24/7. We used rarely but when we had the needs they were there, also the weekend and at late hours during the week. For an agency this is very important. domain or hosting which one are you comparing?